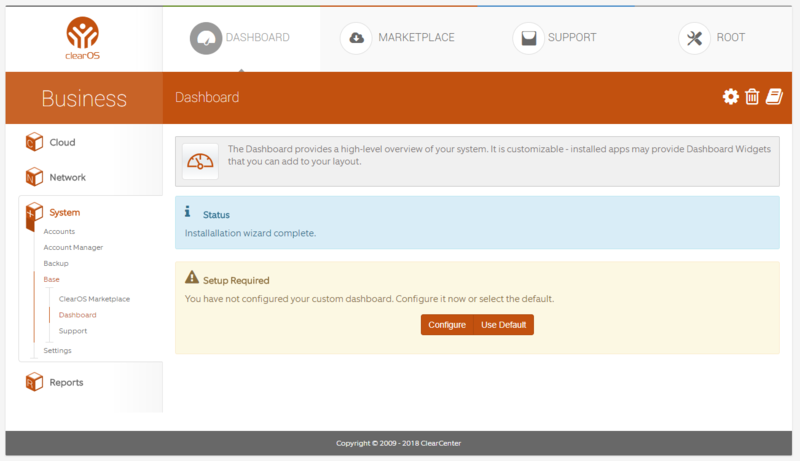 Now that you have made sure your network is configured correctly via the Network Console and you have remote access to Webconfig from a workstation connected to your ClearOS installation, you can register ClearOS. 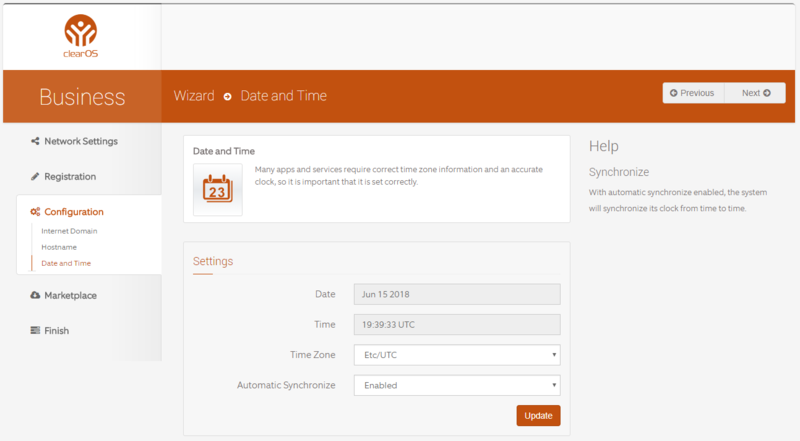 You must register ClearOS to use ClearSDN features, such as receiving software updates, accessing the Marketplace, and using Dynamic DNS. For more details, please review the System Registration documentation article. After authenticating using the 'root' username and the password you created during installation, you will see the following screen. 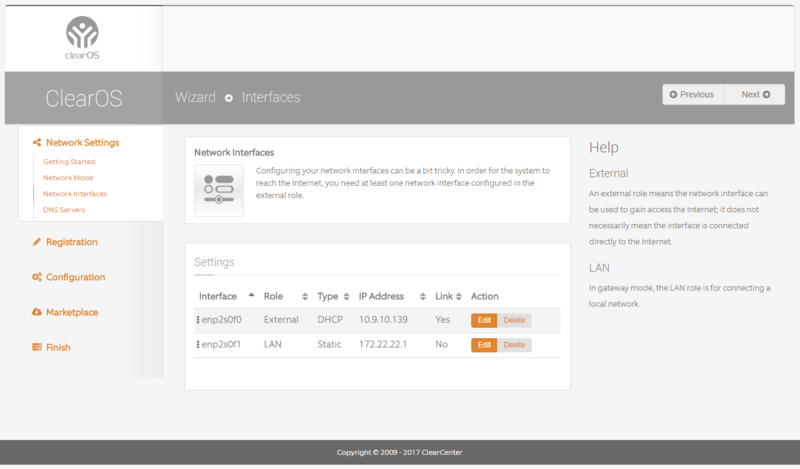 You can change Network Mode at any time after ClearOS is registered by navigating to 'Network' > 'Settings' > 'IP Settings' on Webconfig. You can make changes to the Network Interfaces at any time by navigating to 'Network' > 'Settings' > 'IP Settings'in Webconfig. 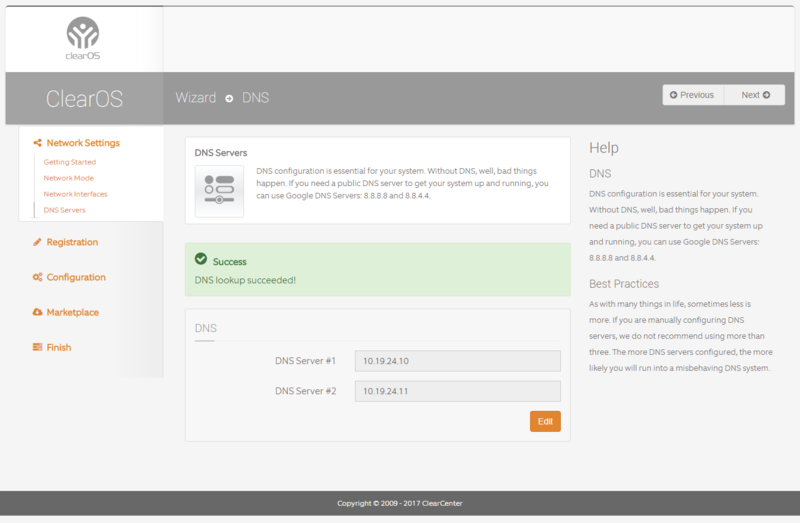 You can make changes to DNS addresses at any time by navigating to 'Network' > 'Settings' > 'IP Settings'in Webconfig. 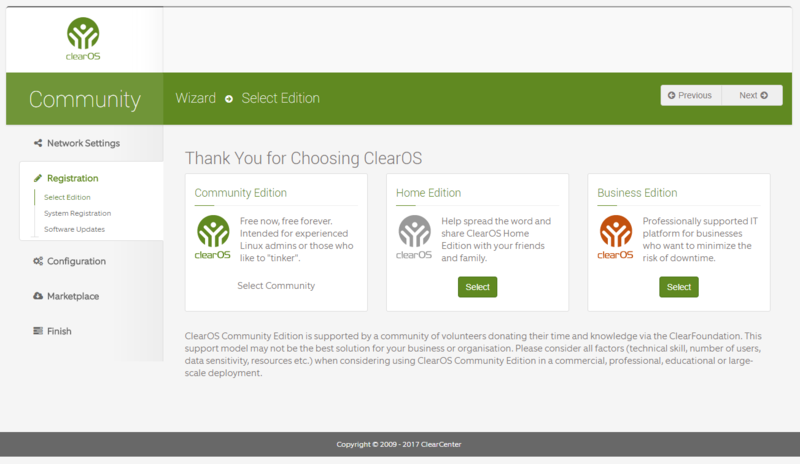 Here you'll need to select which edition of ClearOS you'd like to register. Selecting a different edition will change the theme color as shown below. 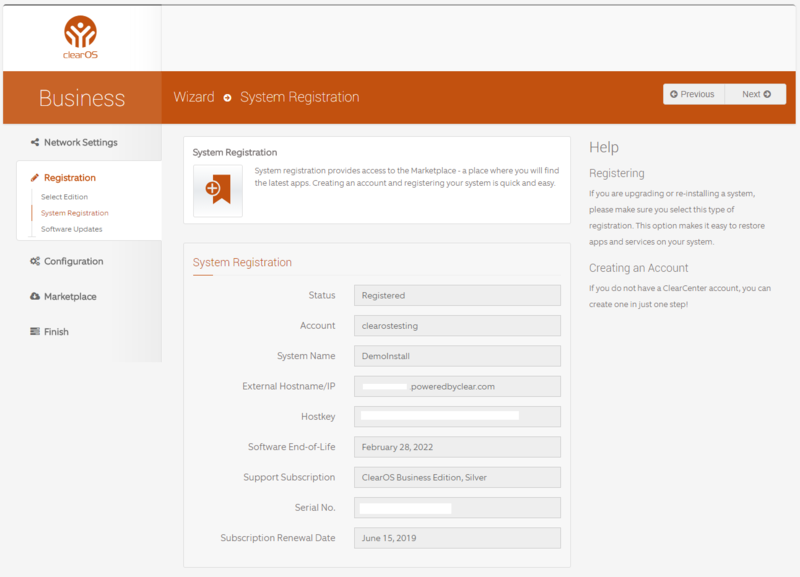 , you'll be take to the System Registration screen as shown below. This is your ClearCenter Portal account username, used to securely login to the ClearCenter Portal. The authentication information above should not be confused with your ClearOS Webconfig login, which is completely separate. 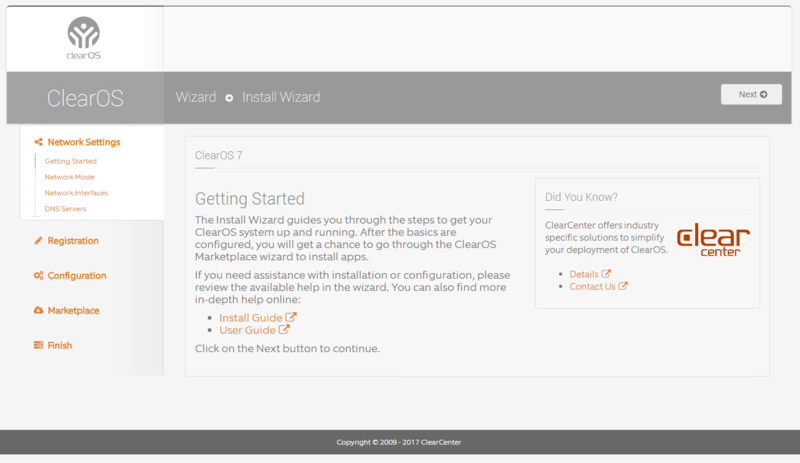 A new installation is when you intend to register a ClearOS system for the first time. Essentially, you are starting from a clean slate. A re-install should be selected when you have a completely new installation, but it is intended to replace an existing system that was previously registered. You will be presented with a list of valid systems in your ClearCenter account. Select the one that you are replacing. Recovering from a disaster event - theft, damage, hardware failure etc. The screenshot below illustrates the dropdown menu that will automatically populate if you have entered the correct authentication credentials to your ClearCenter account *and* select “Reinstall/Upgrade” from the registration type. The eligible systems dropdown is a list of all ClearOS systems registered to your account that could be used to re-register an existing system by way of a re-install or upgrade. If you are upgrading from ClearOS Commmunity to Business, you will also need to select a valid Business key. This is a nickname used so you can easily identify the unit in your account. For example, and organization with offices in Toronto, Vancouver and Halifax might use the city names as the system name to refer to each gateway/server. The system name field will be disabled (read only) when the type of registration selected is Reinstall/Upgrade. This is because the name will automatically be inherited from the previous registration. If you wish to change a system nickname after you have installed your system, you must do it from the ClearCenter portal. Go here. Select which environment best matches where ClearOS will be deployed and used.
. If registration is successful, you will see the following screen. to continue. You will see the following screen. Available updates will load on this screen. It may take a few seconds. button until the update process has been completed as shown below. The following steps are the same for any edition of ClearOS. Next, you will need to enter a domain name. If you have a domain that you would like to use with your ClearOS installation, you should enter it here with this structure: 'demoinstalldomain.com'. You would want to use “non-legit” domain names, like something ending in '.lan' if you have difficulty controlling split-horizon domains. If you have control of your DNS, you will be able to use the proper domain name on your local ClearOS server because you can reconcile internal and external addressing using split-horizon DNS. 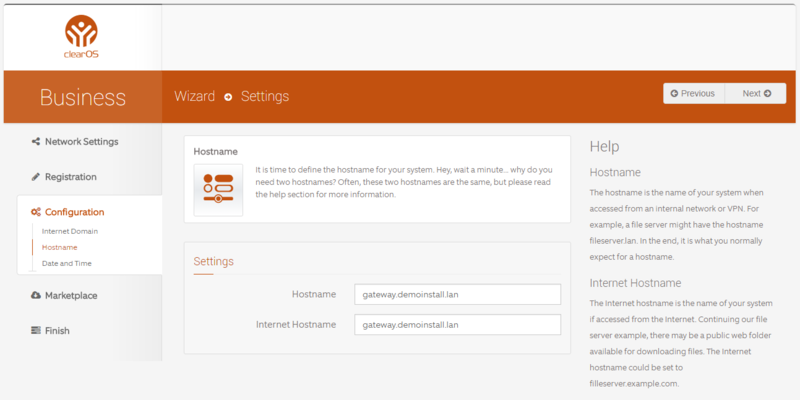 ClearOS will automatically fill in the default hostname. You can change it if you'd like it to be something different. Select your preferred time zone from the drop down. There are many options available. 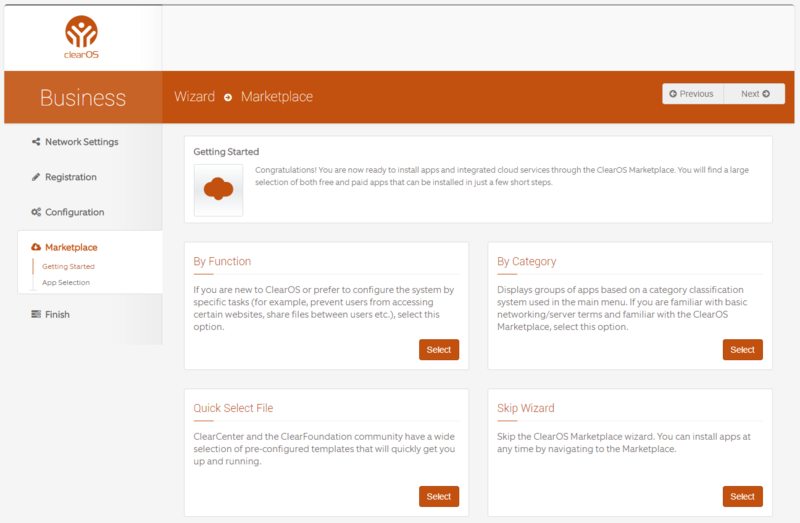 There are a few ways to install ClearOS apps or modules from the Marketplace. To use a Quick Select File, you'll need a '.txt' file that contains the app names so you can quickly select and install apps. HPE SMB Bundle customers can find the applicable Quick Select Files here. Once you're done doing the initial Marketplace tasks, you'll be taken to the next screen for the Dashboard configuration. 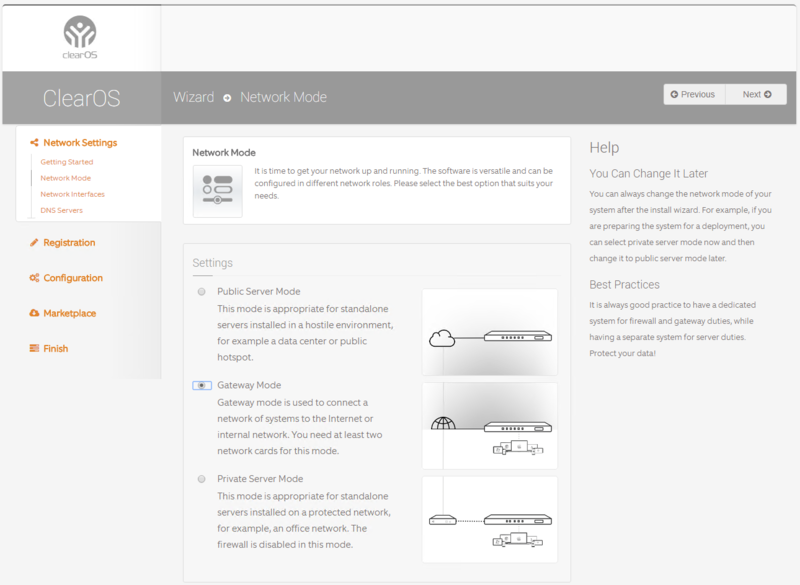 You can configure your Dashboard manually or use the default settings. Click the corresponding button. At this point, you have completed the registration wizard. You can now make changes to ClearOS from Webconfig. If you would like to access ClearOS via SSH from an external host, you'll need to open the corresponding port on the Incoming Firewall (Network > Firewall > Incoming Firewall) if the firewall is enabled. If your subscription has lapsed and you acquired a new subscription, you'll need to re-register ClearOS. 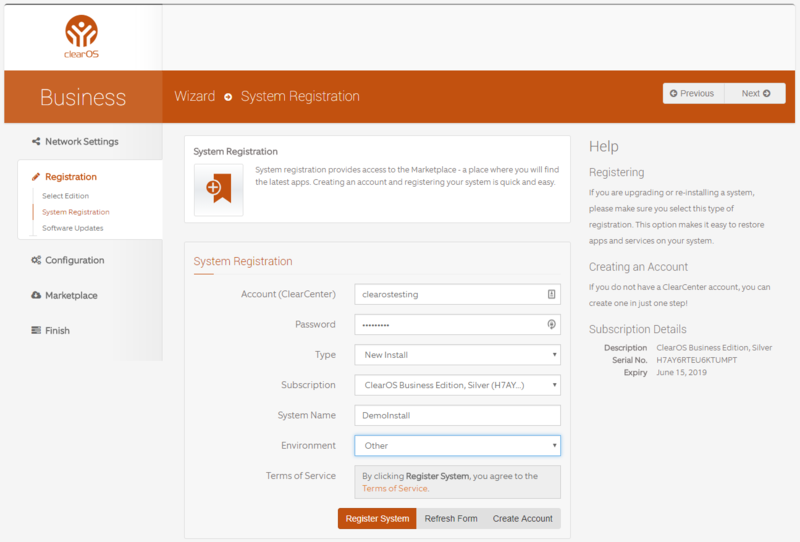 Navigate to 'System' > 'Settings' > 'System Registration' to verify your registration or re-register ClearOS.